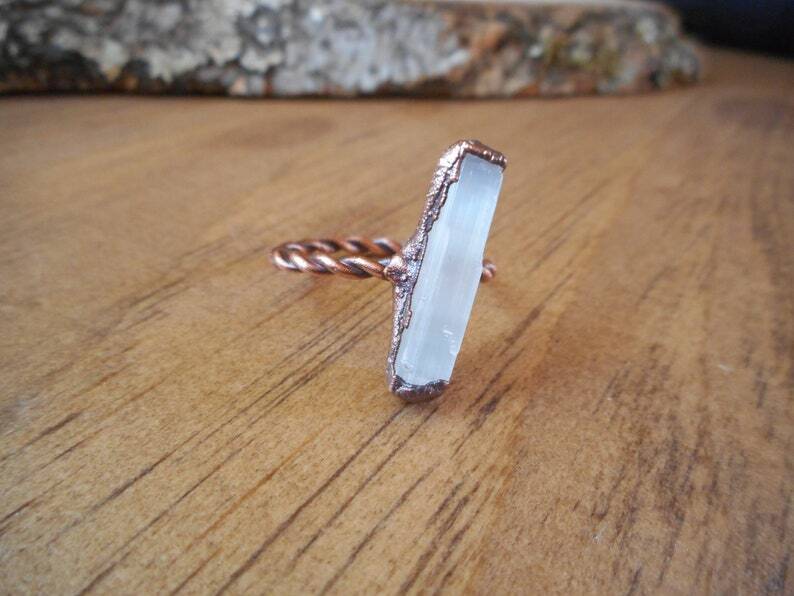 Raw Selenite Ring made by Electroforming, the copper was aged, polished and sealed. This ring is a U.S size 10.5 (20.4mm) approx. the band was made with copper wire and it is twisted, please note that this particular ring has the selenite attached sideways instead of straight, I just thought it would be cool to be different. Message me if you would like a custom order with a different size ring band. While Selenite is an ancient crystal, it is one of the most powerful for the new vibration on earth, attuned to the greater good of all beings. It is a beautiful means for accessing and grounding the Light Body of an individual, and for opening one to the higher levels of Self.